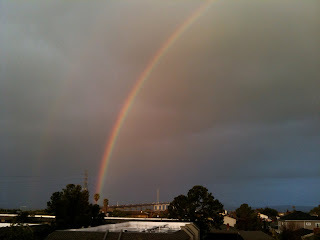 My Life as Jane: California is farting rainbows! We here in California have to deal with many things...state bankruptcy, public schools without art and music, vouchers instead of tax returns, Ah-nold, snails and lots and lots of crazy - but, DAMN, we do good rainbows. There is likely a voucher at the bottom of the empty pot that can be redeemed with the State of California upon its solvency. The leprechauns are gone because they have unionized and are now striking. There are inevitably protestors at the bottom of the rainbow. Californians love a good protest. Could be anything...protests that the rainbow colors are too much like gay pride colors which can't be right because God hates gay people, protests against the anti-rainbow protestors because the rainbow is a show of gay pride and because God loves gay people, protests against unionized leprechauns, protests against leprechaun scabs who have crossed the picket line, Berkeley protestors that don't have anything else to protest at the moment, Sean Penn, etc. It's all ok. We still do good rainbow. As for the puking stick figure on my toilet...it was handmade by a friend. One of a kind, baby! Nice! I'm gonna be in the bay area in about a week. I hope I get to see the rainbows in person. My little brother just moved from Seattle to San Fran last week..hopefully he gets a little rainbow and not snarly unionized leprechauns. lol. Cathy - DOH! I see a tremendous marketing opportunity for your friend here though. Awkward - hope the fog clears for ya! Right now the only way to see the Golden Gate Bridge is to be ON the Golden Gate Bridget.